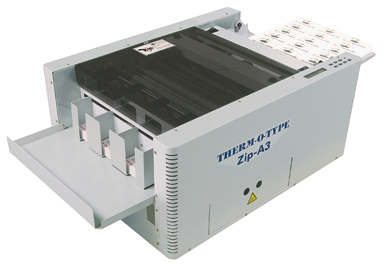 THERM-O-TYPE Zip-A3 Cutter Slitter is designed to handle print-on-demand business cards, post cards, tickets, greeting cards and other multiple-up products commonly produced on digital output equipment. The Zip-A3 is currently the only cutter/slitter in it’s price range with in-line rotary gutter-cut slitting, scoring, perforating and semi-slitting capabilities. A friction feeder is used on the Zip-A3. Maximum paper capacity is rated at up to 1 1/2″ of stock. Infeed paper guides are adjustable with a single knob to the centerline of the machine. A second knob is used to provide micro side-to-side paper position adjustment. Non-marking feed wheels advance stock into the machine. A heavy duty guillotine cutter crosscuts stock as it passes through the machine. Crosscut information is easily entered and can be stored. The crosscut is registered from a mark printed near the lead edge of each sheet. This important feature automatically compensates for vertical imprint registration errors. The Zip-A3 can also register from the edge of the sheet. Using this mode, dark colored stocks, including black, can be run. Programmable crosscutting allows a scissor or a variable size gutter to be removed. The guillotine cutter also removes lead and tail edge trim. After crosscutting, sheets are conveyed to the rotary tooling cassette. A removable rotary tooling cassette is mounted at the delivery end of the machine. Standard slitting blades remove a 1/8″ (.125″) wide gutter. Slitting blade spacing can be adjusted within the cassette. The space between the guillotine cutter and cassette allow two-up 8 1/2″ x 11″ sheets to be cut from an oversize A3 sheet. Slitting, scoring, perforating and semi-slitting tooling can be supported in cassettes. Removable, pre-configured cassettes allow standard products to be easily and uniformly produced. Format changeover, using pre-configured cassettes, takes about a minute. Pre-configured cassettes offer superior flexibility and versatility over machines with fixed tooling or machines that require disassembly and reassembly each time a different job format is run. Pre-configured cassettes also offer unmatched reliability and consistent tooling position accuracy. Finished material is delivered to a receiving platform located at the delivery end of the machine. Partitions are attached to the receiving platform magnetically. Individual partitions are easy to install and adjust. An optional delivery conveyor is also available. This option is especially important for customers producing pre-numbered tickets. The delivery conveyor option simplifies collection of finished material and reduces operator workload. The Zip-A3 can easily handle 24-up business card formats printed on oversized A3 sheets. Using a gutter-cut guillotine crosscut and gutter-cut slitting blades, four-sided bleed cards can be accurately produced. Up to eight, 24-up business card sheets can be run through the Zip-A3 per minute. This allows a five hundred business card order (21 sheets of 24-up cards) to be crosscut and slit in just over two and a half minutes. The Zip-A3 programmable slitter/cutter is not a high production business card slitter. However, the Zip-A3 is a proven production machine offering a unique combination of capabilities and features that make it ideal for any digital output production facility.